IN THE GROOVE: Martin delivered a mix of old and new tunes for the large and appeciative audience. Ever since he burst onto the entertainment scene, circa 2005, with that clean-cut choir-boy image and impressive vocal range, Chris Martin has found favour with listeners all over Jamaica, female audiences especially. His evolution into a modern-day reggae-soul Lothario, crooning in a sweet treble about bedroom knocking, having firm family roots, and living the good life, has only served to widen his fanbase and put the spotlight on an evolving artistry that has placed him in the pantheon of Jamaican male singer-songwriters of the moment who matter. The fans can’t get enough. 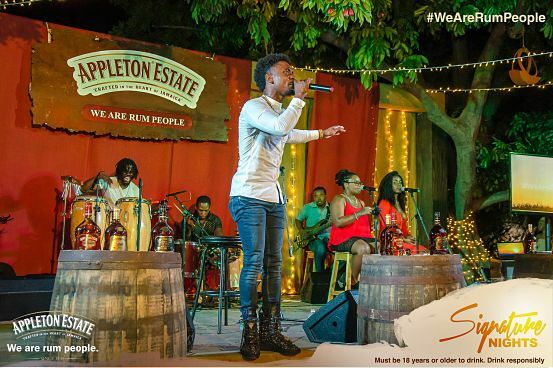 Unsurprisingly, they were out in their numbers at the Redbones Blues Café on Tuesday night to witness Chris’ solo headline act for Appleton Rum’s 50th anniversary Signature Nights concert series. A splendid affair, heightened by the commanding musicianship of the Jam Dons backing band, which offered a musical and visual feast. The venue was exquisitely done-up to mark the occasion. Everyone left the venue fully sated, as their singer (sporting a white dress shirt, skinny blue jeans and black boots) put in work, delivering tunes, acoustic style for the most part, that span his decade-long career, along with some never-before-heard selections. Most intriguing of the new songs was the telling “Pirate of the Caribbean,” on which Chris brags that he’s “slicker than Jack Sparrow, mightier than Black Beard”, “sharp as a blade when I crusade.” Oh, really now? This is Christopher Martin with an edge. But at heart, the 27-year-old star is a lover not a fighter, as evidenced by his body of work and the romantic yearnings of yet another new song called “Magic”, about late-night, candlelight passion and guilt-fee pleasure with the right woman. Martin has a natural talent for this kind of music. Meanwhile, fan favourites like “I’m A Big Deal,” “Mama”, “Just Like You” and “Chill Spot” got the crowd in sing-along mode, but it was sharing the stage with the night’s guest performers that truly lent the concert its electric energy. Busy Signal showed up for the bouncy, attitude-laden “Steppin”, while fellow Big Yard entertainer D Major supplied the hook for their popular collabo “Real Friends,” given an edgy polish this time around. Who knew that Martin, D Major, Chevaughn and Donald ‘Iceman’ Anderson had formed a reggae-R&B supergroup called 87Sex? The brothers formally introduced themselves with a rousing, show-offy treatment of “Till You Do Me Right” – the night’s most extravagant surprise that went down smoothly like rum cream on a balmy, post-Easter night.